Cebu Pacific Promo Fares 2019 to 2020: Cebu Pacific Promo Fare: Low Fare for Cebu! Cebu Pacific Promo Fare: Wala Ka Sa LoLOW Ko! 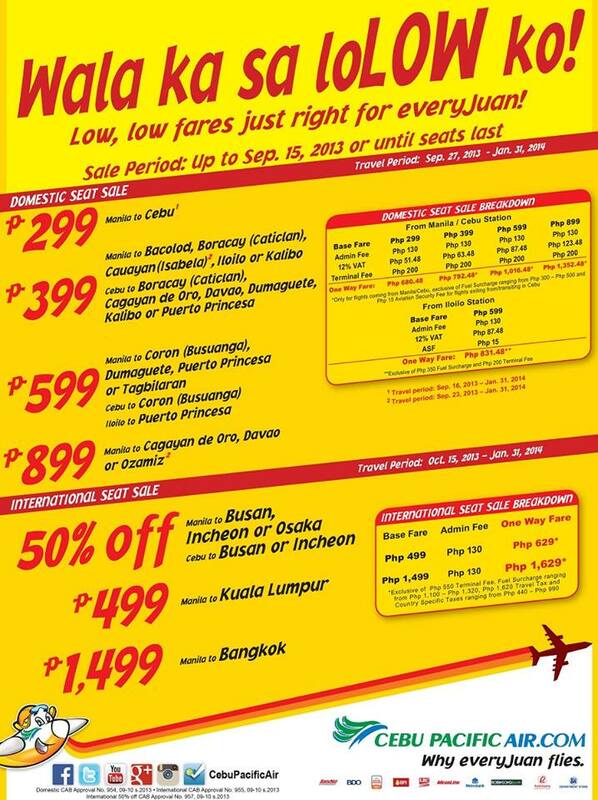 Low, low fares just right for everyJuan! Fly to Cebu for only P299 as base fare. Of course you can fly to other destinations like Bacolod, Boracay, CDO, Davao, Dumaguete, Puerto Princesa of P399 as base fare. There is a 50% off for flights Manila to Busan, Incheon or Osaka and Cebu to Busan or Incheon. While Manila to Kuala Lumpur is at P499 base fare. Manila to Bangkok is only P1499 as 1-way. *Please note that BASE fare is still exclusive of taxes, fuel surcharges and other fees. Our latest #CEBseatsale is up.